Stylish unit designed for easy but trendy living. Includes linen and towels for your use (please bring your own beach towels). The unit has all the comforts of home. Very central to all Mt. 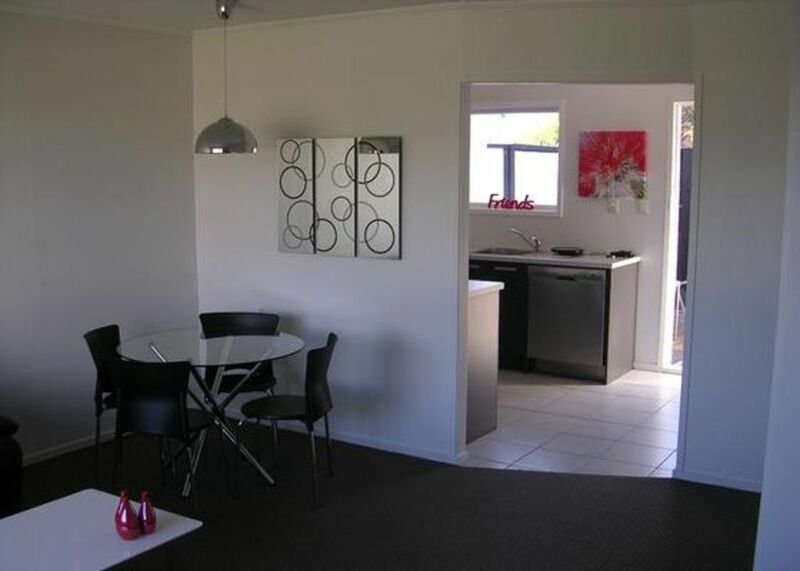 Maunganui attractions with Golf Club short walk around the corner and Omanu Shops 5 minutes away. The Omanu beach is at the end of Golf Road, which is a beautiful and very safe beach having its own Surf Club.Close proximity to the airport. A selection of DVD's supplied for your enjoyment. Outdoor living and entertainment area, sunny and private, stainless steel barbeque.A private decked area in the front for relaxation. A small lock up shed for toys like push bikes, fishing gear, surfboards etc. Convenience is the keyword .... 5 minutes to everywhere. Basic pantry items provided to include coffee, tea, sugar. The unit is one of three with very quiet neighbours. Preference will be given to all bookings requesting a stay of at least 5 days. Full balance of payment due 2 weeks before arrival date except for HIGH SEASON where there is a $200 bond required, and full payment due 4 weeks in advance. If the full balance is not paid by then, owner will relist the apartment to ensure occupancy. Original deposit/bond is non refundable, however special consideration may be given to cancellation requests 3 weeks. Unit is to be tenanted only by those agreeing to rent. No tents, or extras to stay, unless otherwise agreed by owner. If there are extras staying and not notified to owner this is a clear breach of the rental terms. Maximum of 4 people only. Any damage or loss of chattels the responsibility of the renter to replace at their cost be repaired by professionals also at their cost. Any accidents to furniture, fittings or dwelling to be notified to owner immediately in order to take remedial action. Any item requiring maintenance or replacement to be notified to owner immediately. Property is to be left as found. Had an awesome time at the property, Perfect stay away for a family weekend at the beach. Very tidy and has everything you need to enjoy your stay. Highly recommend! Glad you enjoyed your stay. Thank you for looking after our unit so well you are welcome back any time. My family and I stayed here for 4 nights. It is a lovely, clean and tidy little unit close to amenities that is just the right fit for us. My kids were comfortable and we all just were so at home here. Would definitely stay again if we ever got the chance. Thank you. You and your family would be welcome back any time. This was a great wee place to stay, it was clean & tidy & had all the necessities. This was a great wee place to stay, it was clean & tidy & had all the necessities. It was in a great location for getting places too. We would definitely stay again. Neat and tidy unit. Well appointed. Great location for our purpose. Everything there that was needed for a pleasurable short term stay. Thank you.